The ancient pre-Islamic religion of Persia that survives there in isolated areas, and more prosperously in India, where the descendants of Zoroastrian Persian immigrants are known as Parsis, or Parsees. In India the religion is called Parsiism. Founded by the Persian prophet and reformer Zoroaster, the religion contains both monotheistic and dualistic features. It influenced the other major Western religions—Judaism, Christianity, and Islam. The ancients saw in Zoroastrianism the archetype of the dualistic view of the world and of man's destiny. Zoroaster was supposed to have instructed Pythagoras in Babylon and to have inspired the Chaldean doctrines of astrology and magic. It is likely that Zoroastrianism influenced the development of Judaism and the birth of Christianity. The Christians, following a Hebrew tradition, identified Zoroaster with Ezekiel, Nimrod, Seth, Balaam, and Baruch, and even through the latter, with Christ himself. On the other hand, Zoroaster, as the presumed founder of astrology and magic, could be considered the arch-heretic. In more recent times the study of Zoroastrianism has played a decisive part in reconstructing the religion and social structure of the Persian peoples. Though Zoroastrianism was never, even in the thinking of its founder, as aggressively monotheistic as for instance, Judaism or Islam, it does represent an original attempt at unifying under the worship of one supreme god, a polytheistic religion comparable to those of other early peoples. Its other salient feature, namely dualism, was never understood in an absolute rigorous fashion. Good and Evil fight an unequal battle in which the former is assured of triumph. God's omnipotence is thus only temporarily limited. In this struggle, man must enlist because of his capacity of free choice. He does so with his soul and body, not against his body, for the opposition between good and evil is not the same as the one between spirit and matter. Contrary to the Christian or Manichaean (from Manichaeism, a dualistic religion founded by the Persian prophet Mani) attitude, fasting and celibacy are proscribed, except as part of the purification ritual. Man's fight has a negative aspect nonetheless: he must keep himself pure; i.e., avoid defilement by the forces of death, contact with dead matter, etc. Thus Zoroastrian ethics, although in itself lofty and rational, has a ritual aspect that is all-pervading. On the whole, Zoroastrianism is optimistic and has remained so, even through the hardship and oppression of its believers. At present time there are about 200,000 Zoroastrians throughout the world. Most of the worlds Zoroastrians, who are about 100,000, are living in India and they are called Parsis. Due to the Arabs' invasion of Persia, which was cruel (_See Koran Sura 9 “Al Tauba “ Ayeh 5 and 29 and 123 ) , most Parsis left their own country, and emigrated to India in the ninth century. Even, at present time, if Persians are asked about Zoroastrians identity, most of them will answer, those people are fire worshipers, and like Jews and other pagans and Christians, are unclean people ( See Koran Sura 9 Ayeh 28 ). In western countries also, the people are not quite familiar with Zoroastrian philosophy. When they are heard of Zarathustra, they are reminded of “Thus Spoke Zarathustra,” written by celebrated German philosopher, Nietzsche. Therefore, it can be rightly said that Zoroastrian philosophy, which was the main religious belief system of ancient Persians and, for several hundred years was the basis of the Parisian culture and their life style, now is almost forgotten. Therefore, our purpose is to fathom this aged Zoroastrian culture, in order to recognize the truth of such a rich philosophical faith, which has been the foundation of the ancient Parisian civilization, and thus try to repudiate the incorrect pre-judgments against it. Is Zoroastrian Monotheism, Philosophy or Religion in History? It is easy to answer this question. A look at Zoroastrian philosophy shows that Zarathustra, never assumed prophet-hood. He never claimed he had associated with the Lord of cosmos whose wide galaxy extends more than 36 milliard (36 thousand million), light year, which lies beyond our imagination. Zarathustra, never ordered his followers to perform certain activities, but he recommended them to try to know the creator of the earth and heaven and adopt good manner, on the basis of their wisdom. Therefore, Zarathustra was neither a prophet, nor can we call his spiritual path a “religion,” rather he was a thoughtful benevolent who recognized his God on the basis of his wisdom and never said he had been missioned to bring any message from God to human beings. Due to the invasion of Arabs, Alexander of Macedonia, and the destruction of the Persian libraries, there are no reliable sources available to indicate the time Zarathustra lived, nor is there any detailed information about the place where he worked. Therefore, it can be said that in the past some researchers would believe that Zarathustra had lived about six hundred to one thousand years before the Christ. However, today some other researchers estimate the life of Zarathustra up to four thousand years before the birth of Christ. The birth and living place of Zarathustra is not also certain, but some historians suppose that he has been living in one of the Khorasan cities, like Neishapour, Harat, or Balkh. It can be deduced from Gatha, the Divine Songs of Zarathustra, written by him that since he was persecuted by some of his contemporary theologians and religious leaders, he escaped his birthplace and appealed to one of the sovereigns of his time, called King Goshtasb. The king was impressed by Zarathustra’s teachings and followed him. Why Zarathustra Revolted against Mithra, the Belief System of his time and Promulgated his own Philisophy? Considering that Darius the Great, was affiliated with Zoroastrianism, in his petrographies it is written that Zarathustra praised Ahura Mazda (God) as the creator of heaven and earth. Herodotus, the Greek historian also testifies that the Persian religion at that time had been monotheism and they had been blaming idolatry. This is a good reason, why Zarathustra, revolted against Mithra, which was the Persian religion before him. Because, in Mithra, the oneness of God was not known to the people, plus the fact that in Mithra, sacrificing animals and also consumption of narcotics and intoxicating beverages (called Haoma) that keeps the people from good reflection, were prevalent in Mithra and Zarathustra was against them. For such reasons Zarathustra, rose against the Mithra belief system. Zarathusthra seems to have become convinced that all events of the world are based on cause and effects. He has, therefore, based his teachings on three principles: good reflection, good word, and good deed. He was wise enough to recognize that all the motives of human beings are based on action and reaction. Because, the receiver of every good deed in this world will react accordingly with the good behavior. Therefore, in the realm of interaction, if human beings act favorably, they receive favorable reaction and vice versa. In this regard, if a person robs another one, he should not be surprised when some day he will be robbed as well. Zarathustra never imagined praising a God who is a bribe taker. The one, who is bribed by worship and then he rewards his worshiper with a part of paradise. The Almighty God is not a dealer, he is neither a buyer nor a seller, and does not need also to be flattered by his creatures. The almighty God of Zarathustra, is the initiator of justice, kindness, and truthfulness and guides his creatures to the same principles. That is why, Zarathustra, has based his philosophy on good reflection, good word, and good deed. In Zarathustra’s philosophy, everybody has the liberty to choose the right way, out of his/her good reflection and since human wisdom is more related to good reflection, thus the followers of Zoroastrianism should proceed to the propagation of science and education. In this manner, Zoroastrianism becomes the forerunner of knowledge and enlightenment. 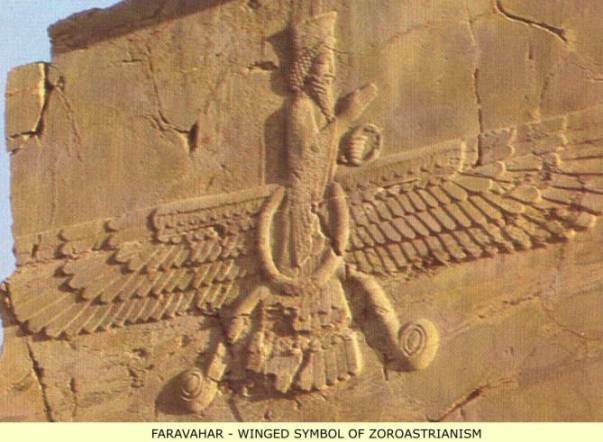 According to tradition, “Faravahar,” is the symbol of Zoroastrianism. Due to the fact that in Faravahars figure, both “Sepanta Minu,” the symbol of goodness and “Ankareh Minu,” the symbol of wickedness are carved, they seem to believe that Ahura Mazda and Ankareh Minu are fighting against each other. Undoubtedly, this attitude which is the basis of Zarvan philosophy is incorrect and does not justify the Zoroastrian philosophy. Unfortunately, in the course of history, sometimes we encounter some biased writers who confuse the reality of historical events. There are some writers, who are willing to ignore the impact of the Persian culture in the promotion of science, and philosophy. As an example, contrary to all the available documents, they say that Abu Ali Sina, has been an Arab scholar, or they do not admit that the Suez Canal has been constructed by Darius, the Great. 1. The Faravahar’s face resembles the face of human being and therefore, indicates its connection to mankind. 2. There are two wings in two sides of the picture, which have three main feathers. These main feathers indicate three symbols of “good reflection,” “good words,” and “good deed,” which are at the same time the motive of flight and advancement. 3. The lower part of the Faravahar consists of three parts, representing “bad reflection,” “bad words,” and “bad deed” which causes misery and misfortune for human beings. 4. There are two loops at the two sides of the Faravahar, which represent “Sepanta Minu,” and “Ankareh Minu.” The former is directed toward the face and the latter is located at the back. This also indicates that we have to proceed toward the good and turn away from bad. 5. There is a circle in the middle of the Faravahar’s trunk. This symbol indicates that our spirit is immortal, having neither a beginning, nor an end. 6. One hand of the Faravahar, points upwards, showing that we have to struggle to thrive. 7. The other hand holds a ring. Some interpreters consider that as the ring of covenant, representing loyalty and faithfulness which is the basis of Zarathustra’s philosophy. In zoroastrianism, the Faravahar or human spirit, embodies two opposing indicators of good and bad. This will clearly show the Zarathustra’s philosophy that everybody should try to promote his/her Sepanta Minu (positive force) and suppress his/her Ankareh Minu (negative force). As a result of such a spiritual struggle toward goodness and avoiding evil, everybody will be able to thrive in all the walks of his/her life. Since, the ring of covenant, which is located in the center of the Faravahar’s trunk is the symbol of the immortality of the spirit, it can be inferred that more human beings try to promote their own Faravahar, more their spirit will be elevated in the other world after they pass away. For that reason, ancient Persians would never mourn at the death of their beloved ones, because they would believe that their spirit will be elevated to a higher level in the other world. Naturally, when we believe that at the time of death, the spirit of the dead bodies would be elevated to a higher level, we have to joy at their departure to another world, rather than being heartbroken, though their loss may be intolerable for us. In this way, in zoroastrianism, on the basis of one’s Faravahar, everybody is responsible for his/her own deed. For this reason, Cyrus the Great and most of the other Persian ancient kings, according to historical documents, not only never forced anybody to be converted into zoroastrianism, they even respected the belief system of others. A very interesting point in zoroastrianism is that “good thought” is the source of human behavior and at the same time it is subject to culture. Therefore, if any of the Zarathustra’s sayings is against the current knowledge of the people, they are allowed to ignore it. 1. Equality between men and women are frequently mentioned in Gatha and we know that in the Persian history, women such as “Pourandokht,” has been reigning in Persia. It is interesting that in 1944, following a long discussion, the United Nations in its latest session at Ghahereh, finally came to the conclusion that the only solution of birth control is the equality of men and women. 2. Cleanliness of water, land, air, and fire is one of the chief characteristics of zoroastrianism and particularly, Herodotus has alluded to the cleanliness of running water in section 138 of his first book in the ancient Persia. 3. There is no mention of the inhumane theory and practice of slavery in zoroastrianism. 4. Another praiseworthy doctrine of Zoroastrians, which is frequently mentioned in Gatha, is denunciation of laziness. Laziness and taking advantage of the products of others toils is strongly reproached as the act of oppression. Everybody should take it upon himself/herself to relieve the oppressed people from exploitation by others. Everybody should subsist by the fruits of his/her own labor. 5. Idolatry, litholatry, and human made places of worship are reproached in zoroastrianism. “God’s house,” cannot be made by human beings with mud and stone, it is the soul and heart of them. 6. In Zoroastrianism not only oppression toward human beings is strongly condemned; Gatha frequently reproaches cruelty against animals. Sacrifice of animals by human beings is considered the criminality of mankind against animals. Considering that “light” and “fire,” are the cleanest phenomena in the earth and can never be contaminated, therefore, Zarathustra elevated and chose them as the symbol of Ahur Mazda. Unfortunately, some people out of ignorance, wickedness or guile try to regard zoroastrianism as a fire-worshipping religion, thus damaging its monotheistic characteristic. Interestingly, the very same malevolent people who try to accuse Zoroastrianism of fire worshipping; they confirm the worthiness of light and fire and light up candles in the house of their God. Miracle or false manipulations is one of the basic foundations of various religions. The founders and traders of such religions try to impel the people to their creed by deceiving them through miracle, and intoxicate them to false pretensions. It is amazing that even educated people, who are erudite in various fields of science, easily negate their own knowledge versus imposture of such people and fall prey to their charlatanry. These peoples are so brain washed by religious traders that although they have tremendous achievements in various fields of science, they are enchanted by religious superstitions and follow baseless ideas. Regarding the phenomenon of miracle in Zoroastrianism, it should be mentioned that Arab invaders put unbearable pressure on Zoroastrians to admit that Zarathustra has also performed miracle to label him a prophet and thereby undermine Zoroastrianism. The contents of Gatha, the only book remained from Zarathustra’s teachings indicate that he never assumed prophet-hood, moreover, his philosophical principles were so wise and strong that he did not need to claim the existence of miracles to manipulate his followers. The men of sagacity and knowledge, who are familiar with historical writings and the contents of Gatha, know that miracle does not have any place in Zoroastrianism. Why Zarathustra’s Philosophy was gradually Forgotten? The answer to this question is quite clear. Zarathustra was against bartering for gaining power through the name of God. He was also against the inhumane sacrificing of animals, which was a lucrative source of income for religious leaders. Moreover, since Zarathustra’s philosophy frequently indicates that three principles of good reflection, good words, and good deed; lead to human exaltation, therefore, there remains no need for religious leaders to assume the role of mediating between God and people like other religions. The meditation between God and people is a lucrative job for clergies and will cause them to extort from the people, the fruits of their toils by promising them heaven and scare them of hell. According to Herodotus, Zarathustra even deprived the clergies from temples and God houses that which they had not made with their own hands. As these artful clergies were deprived of their weapon to trick the people, thus they developed animosity toward Zarathustra’s philosophy. After Zarathustra passed away, the clergies of that period tried to incorporate the doctrines of previous beliefs in zoroastrianism, to pave the way for their own personal profit. In this manner, after the death of Zarathustra, the religions of Mithra and Anahita became so popular in Persia that the King Xerxes was worshiping Mithra and Anahita next to Ahur Mazda. Contrary to the magnanimous behavior of Darius and Cyrus, the Great, when Xerxes prevailed over Greece, due to the recommendations of clergies, he ordered his soldiers to set fire to palaces and temples of Athens. This improper behavior of Xerxes, compelled Alexander of Macedonia to follow suit and order his army to set fire to the Perspolis ( Jamshid’s throne ) and libraries after the defeat of the Achamenedae. Alexander wrongly believed that his action could destroy the exalted Persian culture. On the other hand, since Alexander would like to introduce Persian science and philosophy in Greece, he ordered a considerable number of books to be translated in Greek, before their destruction by fire. After the invasion of Persia and the defeat of the Sassanid, Arab leaders accomplished even a more ignominious behavior, in the sense that they set fire to every written document that they could reach and also they banned Persians from speaking in Farsi, because they wanted to eradicate Persian culture and make them subordinate to Arab language and finally to Arab culture, exactly what they did to Egyptians and Syrians. Fortunately, before Persian language could fade away, Ferdosi, the great Persian poet of all times, caused its survival by his extraordinary literary work of Shahnameh. To prevail over every aspect of the Persian life, Arab leaders also imposed Islam forcefully over Persians and in this regard, committed genocide to Zoroastrians. To justify themselves, they accused them of being fire worshippers. Unfortunately, even after the Arab regime was thrown out in Persia, still prosecution of Zoroastrians continued by fundamental Muslims. This persecution continued up until Reza Shah Pahlavie, came to power and ended such a cruelty to Zoroastrians and also other religious minorities. As a result of the hardships Zoroastrians went through, the Zarathustra’s philosophy was transferred heart to heart and this caused many undue alterations that were not at all in line with true Zoroastrianism. This wicked manipulation was performed by some corrupt religious traders, who wanted to take advantage of religious activities for their own profits and by incorporating a lot of Mithra, Anahita, and Zarvan ideas in Zoroastrianism, they inflicted a great damage to Zoroastrianism. Recent philological studies show that many of the contents of Avesta are not genuine and have been added to it in later periods. Obviously, the men of knowledge and those who are familiar with Gatha and the true philosophy of zoroastrianism, know that many of such baseless principles such as Vandidad, do not belong to Zoroastrianism and they have been added to it inimically to undermine it. If philologists and researchers on Zoroastrianism continue their studies on Gatha (Zarathustra’s Hymns), and also petroglyphs of Darius and Cyrus, the Great that are remained intact, the translucence philanthropic philosophy of Zoroastrianism can be rediscovered. Why Zoroastrianism will Recover its previous Exaltation? They talk of some sharp Trial of us – Pish! These poems will respond par excellence to the baseless rhetoric of religious impostors. At this point, one may ask: “Why clergies of different religions consider themselves, the only broker of heaven and assert that the clergymen of the other religions are ignorant and fraudulent, their followers are aberrant and will finally will be punished by hell. Yet, we may here ask ourselves why would the creator of such a vast cosmos, which is beyond human speculation, ever need representatives on earth to guide several thousand or several millions of people. Zoroastrianism will thus recover its splendor. Having achieved such a summum bonum, it does not matter how human beings label themselves.